The sugar industry being such a diverse industry there was not a great deal of conformity amongst the mills and their rolling stock due to their being owned by different companies. Hence, every mill had its own bin fleet although reasonably similar in size the bins had different dimensions, different couplings, different wheel sizes, different wheel spacing and different capacities. There were six mills in the Pioneer Valley of Mackay up until 1988 when industry rationalisation forced the closure of two mills. The remaining four mills shared the locomotives and rolling stock of the two mills that closed, giving the new owner of the four mills, Mackay Sugar a varied bin fleet to operate. Today Mackay Sugar operates bins of four capacities, 4 tonne, 5 tonne, 6 tonne and 15 tonne. However the 4t fleets of Marian and Farleigh can not be mixed due to different cage dimensions, wheel spacing and coupling heights. All mills have a mixed bin fleet except Racecourse who are the only mill with 5 tonne bins. This is due to the rotary coupling on these bins that allows them to be emptied in a rotary tippler at the mill without uncoupling the bins. All other mills uncouple their bins prior to tipping and re-couple immediately after. Pleystowe is the only mill which can tip all bin types. Farleigh can not tip Marian 4t bins or 5t bins but can tip 15t bins in an emergency however the full bin yard can not handle the bins automatically and they must be fed into the tippler by a locomotive on the rear of the train. Marian can not tip Farleigh 4t bins, 5t bins or 15t bins. Racecourse can only tip 5t bins. The 15t bins are fewest in number as they have only just started to be introduced into service with the intent of phasing out the 4t bin fleets by placing 15t bins at Pleystowe and pushing 6t bins from Pleystowe into Farleigh and Marian. All bins are of fixed 4 wheel design except for the 15t bins which are of a bogey design. 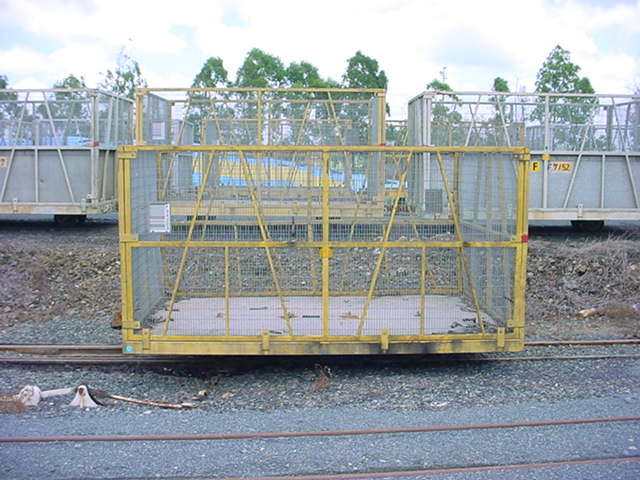 Bins are very basic in design with the chassis and cage frames being constructed of box section steel. The floor and sides are either sheet iron or steel mesh or a mixture of both. No bins have brakes fitted so the only braking in the train comes from the locomotive at the head of the train or a brake van if attached to the rear of the train. Empty bins are very light with the 4t and 5t bins weighing 1.2t empty, 6t bin weighing 1.5t empty and the 15t bin weighing 3t empty. Bins cost approximately $1000 per tonne carrying capacity to construct. I.e. a 6t bin costs approximately $6000 AUD to construct. Simple, cheap and effective. This shot shows the cane being transported into the factory by conveyer after being tipped. To the right can be seen the empty bins exiting the tippler bound for the empty yard. This shows the bracket, known locally as a hornguide, that holds the axle box in place on the 4t bin.. This is Netherdale one of the 94 class locomotives hauling a mixed rake of 6t bins (at the front) and 4t bins up the Longmile gradient on the Farleigh North Coast line. The 6t bins are hauled in the front to assist drivers control train dynamics due to the amount of free slack in the 4t pin and link couplings. Pin and link couplings have approximately 50mm (2 inches) of free slack in the couplings. In a train of 250 bins, the locomotive can move 12.5 metres before the last bin in the train will move. Very easy to tear 4t trains in half. End view of an empty 6t bin. Side view of an empty 6t bin. This photo shows the “W” bracket that holds the axle box in place on the 6t bins. This was an attempt to increase the payload of 6t bins before the 15t bins were introduced. The bin cage has been flared at both ends and the entire cage was raised by 200mm (8”) to increase capacity. Several of these were trialed but they did not like the tighter radius curves in some sidings where the flared ends would come into contact sometimes derailing the bins. The bogey design of the 15t bin and the “M” bracket that holds the axle box in place. 5t bins coupled in the Racecourse tippler before being tipped. This shot shows how the dumbbells are coupled. First step it to drop one of the dumbbells into the opposing coupling. Secondly, the second dumbbell is dropped into place to lock the first dumbbell into place so that it can not fall out when the bins are inverted in the tippler. This shot probably should come first in the coupling series. Before bringing the bins together for coupling, both dumbbells are retired out of the way. The older and cruder link and pin coupling on the 4t bins. Very taxing on shunters fingers and drivers nerves. No one will be sorry to see the last of these. This shot shows a Farleigh 4t bin coupling. Although all 4t bins have link and pin couplings, the Farleigh coupling is different to the Marian coupling as each coupling has a link and a pin. The Marian bins have a pin at one end of the bin and a link at the other end of the bin and because of this can not be turned around as you would end up with two bins facing each other with either 2 links or 2 pins and would not be able to couple them. The Farleigh bins were built like this because the Farleigh yard is a large balloon loop. Every time the bins come in to the yard they go out facing the same way. For example they come in link end leading go around the balloon loop to be emptied and go out link end first. Upon their return they would come in pin end first. Before long chaos would ensure as some of your fleet would be facing one way and some would be facing the other. How to solve the problem? Put a link and pin on every end. In the Marian yard, all bins are run around an angle and turned before backing them into the yard. Hence, no requirement for two pins and two links. An example of a coupling designed to couple Willison automatic couplers to pin and link couplers (6 or 15t to 4t). A Willison automatic coupler fitted to 6t bins. This version is called a Half Willison and is a smaller version of those fitted to locomotives and the 15t bins. As long as the coupling lever is cocked the shunter does not need to go near these couplings. The half Willisons between the 6t bins coupled. The bigger version of the Willison automatic couplers. Known as ¾ Willisons these are fitted to the 15t bins and locomotives. You can see compared to the ½ Willison that these allow for a lot more sideways movement. Goliath is unique at Mackay Sugar as at most tipplers the bins are pushed into position by the axles or the bin headstocks. Goliath when in position lowers to arms between the bins and pushes on the bin cage to move the bins forward. Two full 6t bins waiting to be tipped in the Pleystowe tippler. The bins being tipped dumping 12 tonnes of cane into the conveyer. The bins are completely inverted and are now empty. This process occurs approximately every 80 seconds at Pleystowe and is completely automated, even the uncoupling of the bins. The bins are weighed on the tippler when full, then again when empty. The tare of the bin is deducted from the gross weight to determine how much cane was in the bin. The juice extracted from the cane is tested to determine how much sugar was in the cane and the grower is paid accordingly for weight and sugar content. The road transport unloading station at the North Eton depot, once the site of North Eton Mill. North Eton was the first mill closed in the Mackay district due to rationalisation in 1988. The cane unloaded here is harvested over the Clarke range where rail transport is just not viable. So it is loaded into trucks and transported by road to North Eton where it is transloaded into 15t bins. A “B Double” truck climbing the ramp onto the transloader. The Clarke range can be seen in the background. The truck positioned above the rail bins on the transloader. The “B Double” truck can haul 45t of sugar cane, 15t in each container. This photo shows one of the containers tipping into a 15t bin. 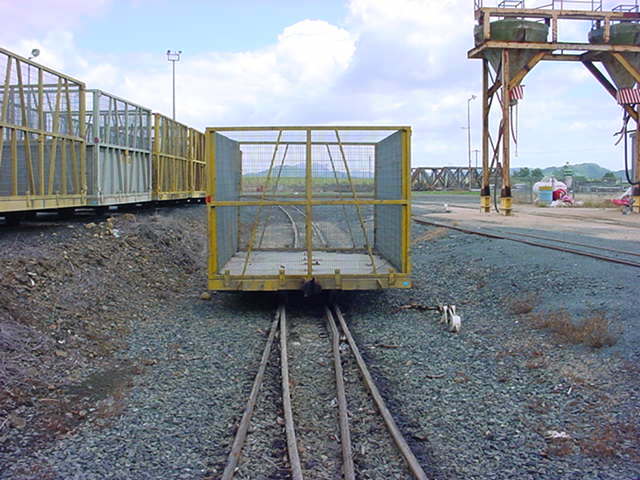 Cane is also hauled in railway bins to rail sidings by truck from isolated areas where rail is not a feasible transport option. The truck will take empty bins from the rail siding to the road transport siding, unload them and return with full bins to unload at the rail siding. Here we see a road transport truck about to unload 3 x 6t bins in the Marian network. The truck will then take 3 empty bins back to the isolated road transport siding and unload them and so on. Here we see the full bins rolling off the truck simply by means of the small incline where the truck is parked. Empty bins are then winched back onto the truck.